To Cite: Ghafoori M, Velayati M, Aliyari Ghasabeh M, Shakiba M, Alavi M. Prostate Biopsy Using Transrectal Ultrasonography; The Optimal Number of Cores Regarding Cancer Detection Rate and Complications, Iran J Radiol. 2015 ; 12(2):e13257. doi: 10.5812/iranjradiol.13257. Background: Transrectal ultrasound guided biopsy of the prostate is the most common modality used to diagnose prostate cancer. Objectives: The aim of this study was to evaluate the optimal number of cores at prostate biopsy, which have the most diagnostic value with least adverse effects. Patients and Materials: Transrectal ultrasonography (TRUS) guided biopsy was performed in 180 patients suspicious for prostate cancer due to either abnormal rectal examination or elevated PSA. The patients were divided randomly into three groups of six-core, twelve-core and eighteen-core biopsies. The detection rate of prostate cancer in each group with the rate of post biopsy urinary infection and prostatitis were compared. Results: Prostate cancer was diagnosed in 8 (13.3%), 21 (35%) and 24 (40%) patients in six, twelve and eighteen core biopsy groups, respectively. Urinary tract infection and prostatitis occurred in 17 (28.3%), 23 (38.3%) and 35 (58.3%) patients in six, twelve and eighteen core biopsy groups, respectively. Considering the detection rate of prostate cancer, there was a significant difference between 6 and 12 core biopsy groups (P = 0.006) and 12-core biopsies detected more cases of prostate cancer, but there was no significant difference between 12 and 18 core biopsy groups (P = 0.572). Considering the infection rate, there was no significant difference between 6 and 12 core biopsy groups (P = 0.254), but there was a significant difference between 12 and 18 core biopsy groups (P = 0.028) and infectious complications occurred more frequently in 18-core biopsy group. Conclusions: The best balance between detection rate of prostate cancer and infectious complications of biopsies achieved in twelve-core biopsy protocol. Twelve-core biopsy enhances the rate of prostate cancer detection with minimum adverse effects. Prostate cancer is the most common cancer in men (1). Most prostate cancers are slow growing, but aggressive prostate cancers are also seen (2, 3). Prevalence of prostate cancer varies widely across the world, but it is more common in developed countries (4, 5). It is the second leading cause of cancer-related death in men in the United States and the sixth cause of cancer-related death globally (4, 6, 7). Many cases of prostate cancers remain subclinical and never have symptoms (8) or have been symptomatically in progressive stage of disease (9). Therefore, using screening method to detect cancer in curable stage of disease is very important. Prostate cancer screening options include digital rectal examination (DRE) and prostate specific antigen (PSA) blood test (10, 11). These screening may lead to biopsy, which is the only test able to confirm the diagnosis of prostate cancer performed via transrectal ultrasonography (TRUS) (11-15). The common protocol used in TRUS guided prostate biopsy is sextant biopsy proposed by Hodge et al. in the late eighties (16, 17). However in the last decade, several studies were designed to evaluate prostate cancer detecting performance by TRUS guided prostate biopsy with more than six biopsies either from other sites of prostate or repeating biopsy in the six previous areas (18-21). The results of studies confirmed the hypothesis that greater numbers of biopsies increases the diagnostic power. On the other hand, each biopsy leads to complications such as hematuria (14.5%), hematospermia (6.5%-74.4%), dysuria (minor complications) and severe complications such as infection and fever episode (6.6%), urinary retention (0-4.6%) and septicemia (rarely) (22), so increasing the number of biopsies increases the adverse effects (23). In this study, we evaluated three most popular biopsy protocols: 6-core prostate biopsy, 12-core prostate biopsy and 18-core prostate biopsy to determine which protocol has the most diagnostic value for detection of prostate cancer with least adverse effects. This study was performed as a randomized clinical trial study between April 2011 and March 2012 on patients suspicious for prostate cancer candidate for TRUS guided prostate biopsy due to abnormal digital rectal examination (DRE) and/or elevation of prostate specific antigen (PSA) referred from urology ward to radiology department of Hazrat Rasoul Akram Hospital. Patients who had a history of previous biopsy, history of prostatic TUR due to BPH, symptoms and signs of urinary tract infections and receiving antibiotic treatment for any reason were excluded from the study. The ultrasound machine was Esaote Mylab 70 XVG (Genoa, Italy) with a multifrequency endocavitary transducer (EC123, 7-10 MHz) equipped with biopsy guide and biopsy specimens obtained with automatic biopsy gun with 18 gauge Tru-Cut needle. 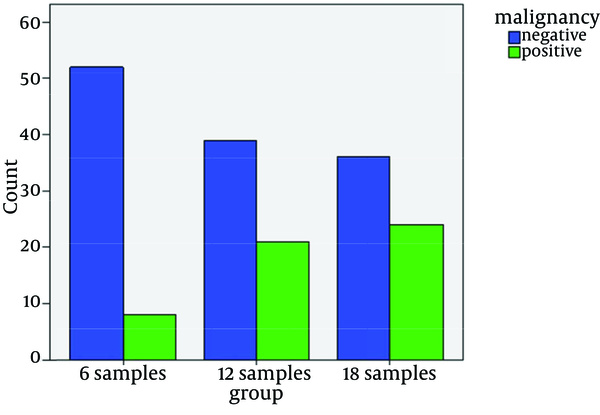 In total, 180 patients entered the study and divided into three groups by block randomization: 1) In the first group, six specimens obtained from the prostate gland considering the following protocol: dividing the prostate to six segments and obtaining biopsies from base, middle and apex of the peripheral zone at both sides of prostate. 2) In the second group, 12 specimens obtained from the prostate gland considering the following protocol: dividing the prostate to eight segments including base, upper-mid, lower-mid and apex in either sides of prostate and obtaining one biopsy specimen from base and apex segments and obtaining two specimens in middle segments; one more medially (including the peripheral zone and inner gland) and one more laterally (pure peripheral zone). 3) In the third group, 18 specimens obtained from the prostate gland considering the following protocol: dividing the prostate to eight segments similar to the second group and obtaining two biopsy specimens from each segment plus additional biopsies from periurethral inner gland in each side. All patients received antibiotic prophylaxis as follows: Metronidazole 250 mg every eight hours and Ciprofloxacin 500 mg every 12 hours, from two days before to five days after the biopsy, also 500 mg of Amikacin was administered by intravenous infusion, 6 and 1 hour before biopsy. All biopsies in all three groups were performed by the same radiologist. Forty-eight hours after biopsies, patients were asked about signs of urinary tract infection and prostatitis especially dysuria. Patients temperature was checked and urine sample was collected for urine analysis (U/A) and urine culture (U/C). The frequency of positive cancer patients and infectious complications were compared between the three groups. The objectives and methods of the study were explained to all subjects and a written informed consent was obtained. Statistical analysis was performed by SPSS ver 16 (IBM, USA). Variables were reported as means ± standard deviations. Normality of variables was checked using the Kolmogorov-Smirnov test. 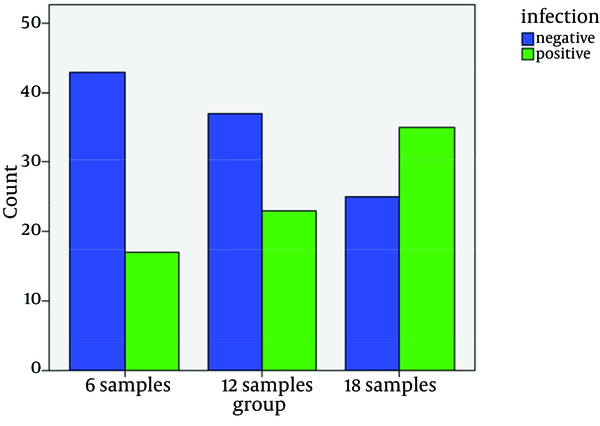 Comparison between groups was performed using Analysis of variance [ANOVA] and chi-square tests. P value lower than 0.05 was considered statistically significant. Patients mean age in 6-core biopsy group was 58.4 ± 7.8 years, in 12-core biopsy group was 57.6 ± 8.6 years and in 18-core biopsy group was 58.7 ± 8 years. There was no significant difference in mean age between the groups (P = 0.731). Mean PSA level of patients in 6-core biopsy group was 8.7 ± 4.6 ng/mL, in 12-core biopsy group was 7.9 ± 4.3 ng/mL and in 18-core biopsy group was 8.6 ± 4.2 ng/mL. There was no significant difference in mean PSA level between the groups (P = 0.617). Histological results obtained from TRUS guided prostate biopsy showed that in 6-core biopsy group, eight (13.3%) of 60 patients had positive biopsy results for prostate cancer. In 12-core biopsy group, 21 (35%) of 60 patients had positive biopsy results for prostate cancer. In 18-core biopsy group, 24 (40%) of 60 patients had positive biopsy results for prostate cancer (P = 0.003) (Figure 1). Binary comparison of prostate biopsy results between each two groups indicated a significant difference in the detection of prostate cancer between 6-core biopsy and 12-core biopsy (P = 0.006). Besides, there was a significant difference in detection of prostate cancer between 6-core biopsy and 18-core biopsy (P = 0.001), but there was no significant difference in the detection of prostate cancer between 12-core biopsy and 18-core biopsy (P = 0.572). In this study, infection rate as one of the most important adverse effects of prostate biopsy was evaluated. In 6-core biopsy group, infection occurred in 17 patients (28.3%); in 12-core biopsy group infection occurred in 23 (38.3%) patients and in 18-core biopsy group infection occurred in 35 (58.3%) patients (P = 0.003) (Figure 2). Pair wise comparison of infection rate between each two groups indicated no significant difference in infection rate between 6-core biopsy group and 12-core biopsy group (P = 0.254), but there was a significant difference in infection rate between 12-core biopsy group and 18-core biopsy group (P = 0.028) as well as 6-core biopsy group and 18-core biopsy group (P = 0.001). The desirable number of obtained biopsies to detect all, or at least most prostate cancers has not yet ratified. In the early 1990s, use of sextant biopsies involving six cores, three from each side of the prostate gland, became the standard approach for the diagnosis of prostate cancer (24-26); but as studies showed that this strategy misses a significant number of prostate cancer (high false-negative rates), hypotheses were proposed to increase the number of biopsies since the late 1990s. While there is disagreement about the optimal strategy, several studies showed that more number of biopsies resulted in detection of about 10-30% more cancers than the conventional sextant biopsy (27-31). On the other hand by increasing the number of biopsies, increasing adverse effects, especially infection and prostatitis as the major and life-threatening complications were unavoidable (32). In our study, we tried to minimize confounding factors that may interfere with the study results, therefore effective factors of malignancy such as age and PSA level became identical in all the three groups of study. There was no statistically significant difference between age as well as PSA level between the three group of patients (P = 0.731, P = 0.617, respectively). Results of our study showed that detecting rate of prostate cancer in 12-core biopsy protocol was more than 6-core biopsy protocol with a significant statistical difference between the results. Although 18-core biopsy protocol detected prostate cancer more than 6-core biopsy, but the difference between 12-core and 18-core biopsy protocols was not statistically significant. In a similar study by Thiesler et al. (33) on 241 patients suspicious for prostate cancer, diagnostic power of 12-core biopsy method was evaluated compared with standardized six-core biopsy method. In this study, the amount of PSA level was less than 4 ng/mL, while the average of PSA level in our study was 8.4 ± 4.3 ng/mL. Results of this study showed that 34% (81/241) of patients who underwent 6-core TRUS guided biopsy had prostate cancer; whereas, an additional 23.5% (19/81) of cancers were diagnosed using the 12-core biopsy protocol, so in low PSA level (< 4 ng/mL), 12-core biopsy is more appropriate than six core biopsy. Our study expressed that increasing the number of biopsies from 6 to 12 increased cancer detection rate (35% versus 13.3%), but increasing 12 to 18-core biopsy resulted in no statistically significant difference for detection of cancer (P = 0.572). Guichard et al. (20) in a study designed prospectively evaluated the diagnostic yield of 6-core biopsy, 12-core biopsy, 18- core biopsy and 21 core biopsy protocol in prostate cancer. In his study, cancer detection rates using 6-core biopsy protocol was 31.7%, for 12-core biopsy was 38.7% and for 18 and 21 core biopsies were 41.5%, and 42.5%, respectively. The 12-core protocol improved the cancer detection rate by 22% compared with the 6-core protocol (P = 0.0001). 18-core biopsy compared with 12-core biopsy scheme increased the diagnostic yield by 7.2% (P = 0.023). In Guichard study, there were statistically significant differences between 12 and 18 core biopsies, which is in contrast with our study. This difference may be due to difference of PSA level distribution in both studies. In our study, mean PSA level was almost the same in each three groups, but in Guichard study patients were divided into three subgroups according to PSA level (PSA ≤ 4 ng/mL, 4 < PSA < 20, PSA ≥ 20 ng/mL). In recent years, increasing the number of biopsies played such an important role in detection of prostate cancer in such a way that saturation biopsy was used to detect prostate cancer with a more accuracy (In general, saturation biopsy is considered as a minimum of 20 cores taken from the prostate). Although, the usefulness of this approach is unset (34). There are several studies such as Kojima et al. (35), Matsumoto et al. (36), Terris et al. (37), Stamatiou et al. (18), Taylor et al. (38) and Eskew et al. (30) studies, which all have consensus on usefulness of increasing the number of specimens more than 6-core biopsy to increase the power of prostate cancer detection. However, the optimum number of biopsies required to detect prostate cancer is still largely unknown. In contrast, there are a few studies in which there are not statistically significant differences between 6-core biopsy, 12-core and 18-core biopsy in prostate cancer detection (39, 40). Furthermore, our study investigated the most important complication of biopsy as infection; 12-core biopsy protocol resulted in 38.3% urinary tract infection and fever versus 28.3% infection rate in 6-core biopsy protocol, which was not statistically significant (P = 0.254). Nevertheless, infection rate in 18-core biopsy protocol was 58.3%, which had a statistically significant difference with 12-core and 6-core biopsy protocols, respectively (P = 0.028 and P = 0.001). Eichler in his systematic review of cancer detection rates and complications of various prostate biopsy approaches in 20698 patients stated that 12 core biopsy approach seems to have optimum balance between the cancer detection rate and biopsy complications (27). In addition, the study designed by Simon and colleagues demonstrated that adding the number of biopsy did not improve detection rate of cancer, it leads to increased morbidity and adverse effects, especially infection (41). Our study results showed that increasing the number of obtained biopsies from 6 to 12 is logical and increased the detection rate of prostate cancer significantly, but further increase in the number of biopsy specimens from 12 to 18 only increased post biopsy infectious complications without significant increase in cancer detection rate. We concluded that the optimum number of obtained prostate biopsies to reach acceptable diagnostic power with least infection rate is 12-core biopsy. This study was an approved research project in Tehran University of Medical Sciences and supported by a grant from this university. Funding/Support: This study was an approved research project in Tehran University of Medical Sciences and supported by a grant from this university.